Every Friday, you can link up your FAMILY PRODUCT REVIEWS to my Product of The Week linky. 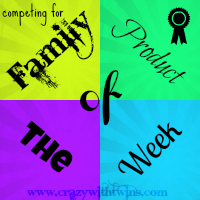 Every week I will choose a "Family Product of the week" from the previous week's reviews. That will be tweeted out to all my followers and acknowledged on my blog. 1. You may link up as many reviews as you like each week - but for this to work - each one should have the Family Product of the Week badge at the bottom, or a link to this page. 2. You must comment on at least two other reviews from the linky - if you're not sharing comment love - what's the point? 4. Reviews only - no sponsored posts. Giveaways allowed only if accompanied by a review. 5. You must not link up old posts - only reviews written since the last Friday! 6. On the linky - Please enter the name of the product - NOT your blog name.